Colombian police believe an Adelaide woman arrested for allegedly having an estimated $US1 million worth of cocaine in her luggage could have been working as a drug mule. 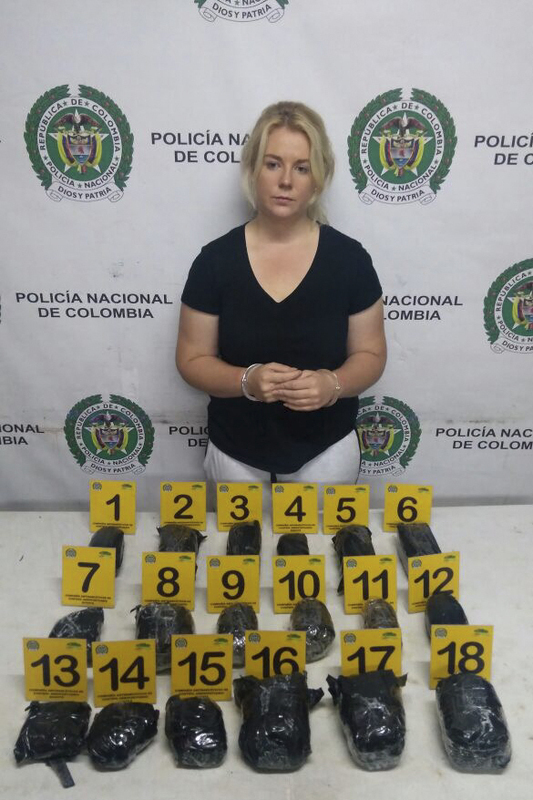 Jorge Mendoza, the ports and airports director for Colombia’s anti-narcotic police, says 22-year-old Cassie Sainsbury was arrested at El Dorado International Airport in Bogota on April 12 after a tip-off about the 5.8kg of cocaine allegedly hidden inside 18 headphone boxes in her suitcase. “She could possibly be a drug mule,” he told ABC radio through an interpreter today. The Adelaide woman’s family insists she is innocent and was set up by a Colombian man she met after arriving in the South American country on April 3 during a working holiday. They say she bought the headphones from him to give as gifts to family and friends at her upcoming wedding. Mendoza said Sainsbury could face a lengthy jail term if found guilty. “Depending on the qualities (of the cocaine) we believe the maximum could be 20 years,” he said. Mendoza noted that per capita, Australians are among the biggest users of cocaine in the world. A UN report in 2013 found Australians were the world’s eighth highest per capital users of the drug. Colombia’s National Police have released photos showing a handcuffed Sainsbury standing in front of 18 individual packages wrapped in black plastic. Meanwhile, Sainsbury’s family have closed an online fundraising account they set up last week after receiving just $4232 in donations from 105 people – well short of the $15,000 they hoped to collect to help cover legal bills. Australian author Rusty Young, whose book Marching Powder was based on the three months he spent with an English drug smuggler in prison in Bolivia, has lived in Colombia for eight years and says he doesn’t believe authorities there will make an example of Sainsbury. “Basically, the bigger traffickers are the ones they are after,” he told the Seven Network. “Small traffickers are just an annoyance for the country. Young said conditions inside the El Buen Pastor prison where Sainsbury is being held were “pretty horrific”. “There is massive levels of overcrowding inside the prison,” he said. The Department of Foreign Affairs and Trade says it is providing assistance to an Australian woman arrested in Colombia, but offered no further details due to privacy.